Hmmm, a rhubarb accord? Sounds fascinating, especially since you call it "futuristic rewriting of the green chypre genre". Denyse, I never thought about as you say "the violence of spring", but you're completely right, those seeds and bulbs bursting through the soil like knives! And what an intriguing list of components in the new Aedes; you've piqued my interest! I am intrigued! I'd love to smell it IRL. I've really started enjoying the smell of rhubarb lately... This sounds interesting. Rhubarb is worth to be put on a perfumed pedestal. Just have a look: Dark green oxalic-toxic leaves on bright red stems. A jaunty tart-sweet taste capable of giving the typical cake aroma world a wild kick. Hothouse rhubarb is supposed to be sweeter. Also more violent? Personally, I can’t enjoy rhubarb compote without some complementary sweetness, which makes me wonder what are the materials Bertrand Duchaufour may have used for olfactory comfort to keep the pain of the “incision” and “violence” at an acceptable level. The other admirable aspect of your post is the exciting construction-deconstruction story. I would love to read more interviews such as this. Listening to perfumers disclosing some of the thinking and feelings when working at a challenging perfume architecture is quite fascinating. A final point: it seems that our current assortment of green smelling molecules is large enough that the nose can travel from top to base through the whole olfactory pyramid and still be in a green universe while experiencing quite some adventures on each floor. That is wonderful! Would Papyrus de Ciane by P. Guilleaume with its Galbanum top, vegetal leather and mossy cellar also belong in this category? Addendum: What was the name of the perfume? Sacre du Printemps? 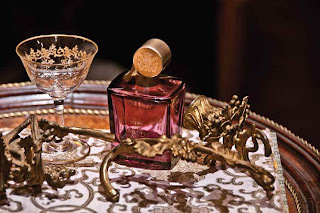 I have a decant of Guerlain London, which has a very prominent rhubarb note - tart! Would love to try M. Duchaufour's creation! Thanks for the draw! We've had so much sudden warmth where I live that spring *has* seemed rather violent this year: green things in such a rush to germinate that they almost seem to rip themselves apart in sprouting forth. As ever, I love reading these exchanges between you and BD -- and I'm enjoying reading a whole book of these conversations, since your book arrived from Amazon a couple of days ago! I really liked the rhubarb note in Tommi Sooni II and found myself wishing for more. I'd love to smell Duchaufor's new Aedes perfume. Very curious about this rhubarb perfume, I smell rhubarb in Jardin sur le Toit of Jean-Claude Ellena for Hermes...and somehow many of my friends tell it smells "like shower gel"!!! Probably because of fruity-rhubarb note which makes them think about pies rather than fine perfumery??? And on consumer goods perfumery - for those who live in France and love rhubarb - try Super U own brand Fraise Rhubarb shower gel... in my opinion best ever fruity shower gel for last 5 years!!! JAntoinette, as a Canadian, I've always been aware of the violence of spring... I think people in snow-bound countries know what I mean. And Aedes de Venustas expresses this very strongly. Furriner, it's interesting how certain smells seem to make their way into our consciousness (and tastes) just as some perfumers are working on them. Zeitgeist? Maria Ho, you're in too! Now I will have to start searching out Rhubarb perfumes next time I go to the city. I have nothing but cooking with it as a reference. I am sure this is going to be very different. Thanks for having a draw. Joey R., I think it's the dark chypre structure that provides plushness around the incisive green note. There's no migraine-inducing stridency here. 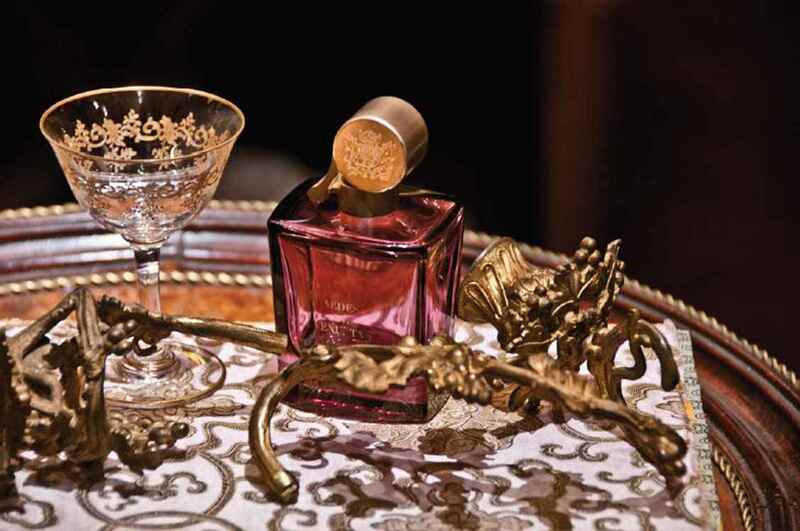 I agree it's fascinating to discuss a scent's architecture with a perfumer: how the form works to tell a story or create a world. And Joey: it could've been called Sacre du Printemps, definitely, but it's Aedes de Venustas's signature scent, so it's called Aedes de Venustas Eau de Parfum. Jarvis, same here in Paris: spring sprung practically overnight and all the plants are exploding (as are the pollens -- atchoo). I'm glad your book made it to you! It's true of course that having clocked in so many hours discussing with Bertrand, we've managed to find a common language -- he's a great teacher and a great listener. Kathryn, well, here's your chance! Lili_Al, thanks for the heads-up on the Super U shower gel, there's a store nearby so I'll pop in for a sniff. I think it may be the watery-fruity register of the Jardin that makes people say that... Of course, nowadays, you can wear vintage Diorissimo and people will tell you it smells like toilet spray! Mind you, there are lots of functional scents that I find easily better than most mainstream launches. ShellyW, I'd never really given it much thought as a note until this particular accord. The way it's treated really sets it apart from the sunnier stuff though. Another big fan of Duchaufour here! I have two large rhubarb plants in my garden and will have to go look when I get home from work to see if they are bursting through the soil! Queen Cupcake, you're so lucky to have a garden... Have a good sniff for me! I love these interviews too! It sounds like this will be very different from the rhubarb "sherbet" thing he did years ago for Comme des Garcons. I can't wait to try it. Janice, I didn't remember he'd done that rhubarb sherbet -- I knew he's signed two in the Green series. Definitely a very different animal! I love green scents, and this sounds like it would be my new favorite perfume. Please enter me in the draw, thanks. 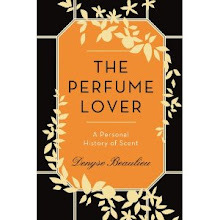 Just few words before reading your post: The perfume lover has just arrived, I've already read three chapters. Can't wait to have it signed! OK,, now I'll read the post and of course, I will be happy to enter the draw. Loving to learn about perfumery in interviews like this. I am not at all sure this will work on me but I do love incense. It's hard for me to find green scents that don't go sour on me. I do like PdN Odalisque so there's hope for me yet. Thanks for the draw! I don't know which rhubarb-like aromachemical is used here, but I have Rhubafuran in my scent library, and it is a violent beast! It leaked a little during my most recent move and poisoned about 10% of my library, and a number of books. Where that molecule goes, nothing can follow after, it is impossible to remove...I'm not surprised you had to run for cover! I'm on the last 1/3 of your book, and I just had one of the weirdest coincidences happen. I just read about how you loved that Luca Turin said he'd risk scofula to get his old Brut back. I've got House reruns going on the tv. What obscure 17th century disease did the team discuss in the conference room? Scofula. I've never heard that word in my life until today. On another note, please do enter me in the draw. I promised myself I'd wait until I'm finished with your book to comment on it and Bertrand's creation, but I can't. The perfume is so good that I want to make love to the nearest orange tree I can find. Hi Denyse: I truly love a rhubarb note, and, completely coincidentally, I'm wearing "Lady Rhubarb" by D.L. & Co. (no longer made as a fragrance, but still part of their candle and home fragrance line). I love the tart nature of the note. I'm afraid that name will create confusion, won't it? Aedes de Venustas EDP? Was their original incense Duchaufour scent called AdV EDT? Will that one remain available? I'd love to be in your draw. Thanks so much. That's fabulous. I have always found the green notes in Amaranthine very incisive and 'vertical': present from top to bottom. Other people don't seem to perceive the green in Amaranthine all that strongly, but I certainly do. Cheesegan, you'll never know until you try, so here's your opportunity... It's definitely a scent with a huge amount of character! Heather, you're right, this is truly a time to crave green! Armellide, it's really something I want to do more of. Not all perfumers are able to speak so clearly of their work, and not all have such a definite idea of what they want to achieve (often because they aren't given the chance), but there are enough to keep the conversation going. Sujaan, there's a chance this might turn sour on certain skins since it's a very acid note, but you'll never know until you try, right? Marla, we discussed a lot of raw mats off the record -- this is a 12-line accord. It's certainly the strongest thing I've smelled in a lab. Seeped all the way into the staircase. GG, that's a great way of putting it! Carrie, I don't know if that House episode mentioned that kings were meant to have the power to cure scrofula by touching the patient (at least in France)... Love Luca for picking that term too, which I remember puzzled the copy editor terribly! On a less gory note, I'm very happy you love Séville à l'aube enough for it to inspire ideas that sound like they're drawn from some Greek myth! I'm not entirely objective, of course, but I find the scent enormously addictive, and I'm getting a lot of great feedback on it. Hope you're enjoying the book too! Joe, I suppose the fact that one scent was co-branded with L'Artisan and the other is the first of the Aedes de Venustas signature collection will set the two apart. The bottles also look pretty different. Annemariec, I'll have to revisit Amaranthine with that in mind. I'm more sensitive to the creamy ylang-banana-milk aspect. I love many green chypre scents and would love to smell this one. I wonder how incense goes together with rhubarb(incense being a tricky note for me), but hope this scent would remind me of the early summer when we get the rhubarb here. Please put me in the draw. I'm intrigued. I have never smelled a rhubarb perfume and I would love to try this one. Thank you! Ingeborg, I wouldn't call it a summery scent... but then, it's so un-traditional it's really a creature of its own! Mike Perez, it is. I was in the Jovoy boutique in Paris where it pre-premiered, and it's so distinctive I recognized it instantly on a friend who'd been skin-testing it, without even smelling her wrist. Irina, if I may shamelessly plug my book here, there are dozens more of these insights in it! GG, aldehydes treated in a certain way can definitely go Day-Glo. I got that from Humiecki & Graef's Multiple Rouge -- a radioactive fruit salad. I haven't properly tested Shiloh, but Fabrice Olivieri, the perfumer, tends to have a very forceful style. In Aedes de Venustas, the stridency is in the acidity and intensity, and above all the contrast. Lovely interview about a fascinating new concept. Please include me in the draw. Kuromi, thanks for adding the comment, I was perplexed by the first message! You're in. There is lack of diversity in perfumes nowdays. Bellatrix, definitely! I went to Sephora's yesterday to smell an assortment of mainstream fragrances and only one was memorable, whereas Aedes de Venustas can be recognized with just one sniff! "a futuristic rewriting of the green chypre genre"? I like the idea of a green blade slicing through the layers of perfume. As a structure it reflects a very contemporary aesthetic vision but rooted in classic tradition. I believe that role has also been played in the past by incense, galbanum, civet or angelica. Rhubarb and incense? It is a good thing this is by Duchaufour, I would try anything done by him. Kostas, that's interesting, could you elaborate a bit more on how this is rooted in a classic tradition? Though civet acts from top to fond, I see it more as something that wraps the other notes. Angelica is so evolutive it can't support greenness throughout. I'd love to hear your take on this. Janet, so would I. I don't love everything (I just can't do fougères to start with) but it's always an interesting ride. And Aedes is particularly original. "the force that drives the green fuse drives the flower..."
My rhubarb is already coming up in this early spring - I'd love to smell this new green chypre - thanks for having the drawing. Nancy G, thank *you* for Dylan Thomas. This sounds quite interesting. I like the image of the violence of spring... it's a little bit like this right now here. Fernando, yes, I've been told the weather's been crazy on your side of the Atlantic. It's pretty warm here too... Not complaining, but I went from winter coat to teeshirt inside a week! Very exciting! And BTW your book arrived today here in chilly damp California. Wow! I would love a chance to try this! I have a weakness for green chypre scents and this sounds special! You'll have to leave a name though! Please enter me in the drawing. That sounds like an amazing perfume experience! ElizaC, it is, and you're in! I would love to try this, rhubarb and vetiver, spring has sprung! Very nice description of the rhubarb note. I can almost smell it. My mother used to cook a rhubarb compote. It is still my favorite. It is so refreshing. And it reminds me of my childhod. I like the destinctive smell of fresh cut rhubarb. Stephen, you're in the draw! Another Duchaufour's creation! Bring it in! I was too late for the last draw (as I have just received your book), so hoping to having my luck this time. Thank you! Ela, sorry about the last draw, I'll be doing another one later on... You're in this one though! Civava, lots of people seem to have fond memories of rhubarb -- perhaps Bertrand D does too, didn't think of asking him. Jay, yes of course, BD has lots of projects under way, and I've smelled a few things, but it wouldn't be playing fair to his clients to spill the beans, now, would it? I forgot all about rhubarb! Rhubarb pies were are frequent treat when I was a child. It should add a maniacally tart twist to the green chypre. Do I smell spring in the air? This rhubarb sounds fascinating. I'd love to try it. Ana, you've captured the vibe perfectly! Cheryl, "a maniacally tart twist" is an eloquent way of putting it! Spot on. Since falling in love with the rhubarb in Rose Ikebana I have admired its contributions to perfumery. Thanks for the generous draw! Wow, violence of spring? I just never thought of it that way! I have a whole new take on this season. Love anything Aedes so I am intrigued. 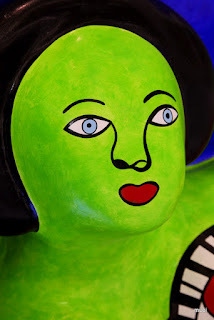 Sujaan, that's what a piece of art does: changes your take on things. And that's what a critic can do: put words on that take. I live in Nova Scotia, and rhubarb will be just about the first fruit of the spring-my mouth waters at the thought of its acidity! 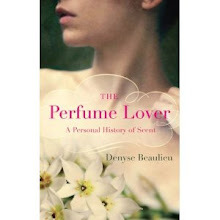 I am a fan of BD's work-I think i am the only person on the planet who bought Fleur de Lianne. I just love it! Vetiver and exotic plants-to me wearing it makes me feel like I am standing in that tropical forest, smelling really wet, redolant air. I'm not a critc-I don't have the ability to describe what i am smellin'. Hope you are well,and I look forward to reading your book! Carole, waving across the Atlantic to a fellow Canadian! I love Fleur de Liane as well. I never ended up buying a full bottle, but if one swung my way I'd wear it gladly. I think you describe its effect very vividly! That sounds interesting - the green notes ... please enter me into the draw. Thank you. Interesting choice of artwork, given NdSP's lovely chypre creation. I love Aedes and would feel privileged to sample this fragrance. Thank you. Would love to sample this! Sounds so unusual! Ursula, anonymous commenter and Lisa, unfortunately the draw is over but the fragrance will be available any day now at Aedes in NY. Wasn't there already an Aedes EDP, also by L'Artisan? The only thing they seem to have in common though is the purple bottle and the incense accord. Klaudia, yes there was, as I mention in the intro to the interview. Both the colour of the bottle and incense accord are part of the Aedes brand identity it seems!